Every July since 2010, Midnight Sun Theatre has joined forces with Anchorage Community Theatre to bring an exciting offering for the summer and this year is no different. 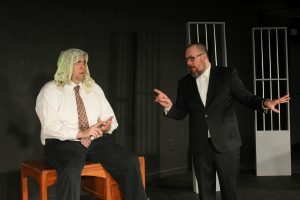 Opening July 7th and running Friday-Sundays through July 29 at ACT will be the John Mortimer British comedy The Dock Brief about the hapless barrister Morgenhall (played by Frank Delaney) trying to defend the equally hapless confessed criminal Fowle (played by R. Scott Cantrell). Delaney and director/founder David Block drop by Stage Talk this week to let us in on all the fun. ORIGINAL BROADCAST: Friday, July 7 at 2:45 p.m.